I guess my previous post indicating that Mars Spirit might be dead was a bit premature. 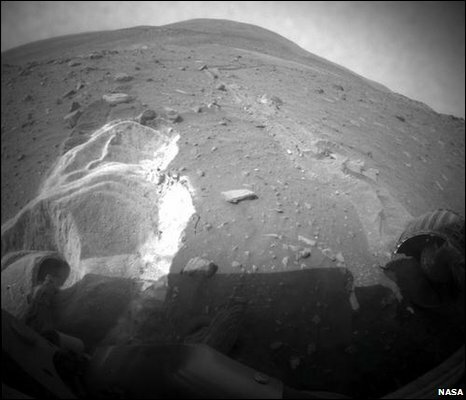 In fact, Mars Spirit appears unable to move from its current location, but its instruments are still working and therefore it can still perform scientific inquiry for however far out its arms and cameras will reach. Still, it appears that NASA has given up on the possibility of Mars Spirit rover ever moving from its current location (shown below) due mainly to failure of 2 of the 6 wheels.